2. 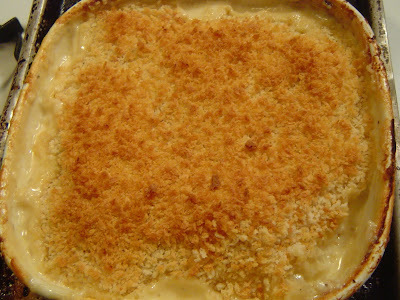 In a small sauce pan add milk, heavy cream, butter, garlic powder, and onion powder. Heat over medium heat until butter is melted, stirring occasionally. Add a dash of salt and pepper. 3. 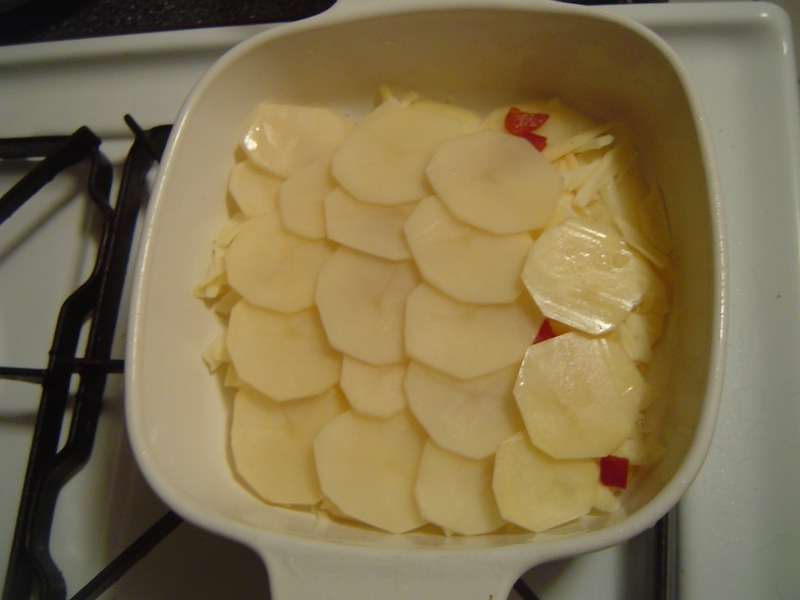 In a small casserole dish (mine was approx a 5x5) lay a single layer of potatoes slightly overlapping. Next layer a light amount of cheese and sprinkle some pancetta. Repeat two more times and then add your top layer of potatoes and cheese, but not the pancetta on the top layer. Pour milk/cream mixture over potatoes and cover. 4. Place in a 350 degree oven and cook for 40 minutes. 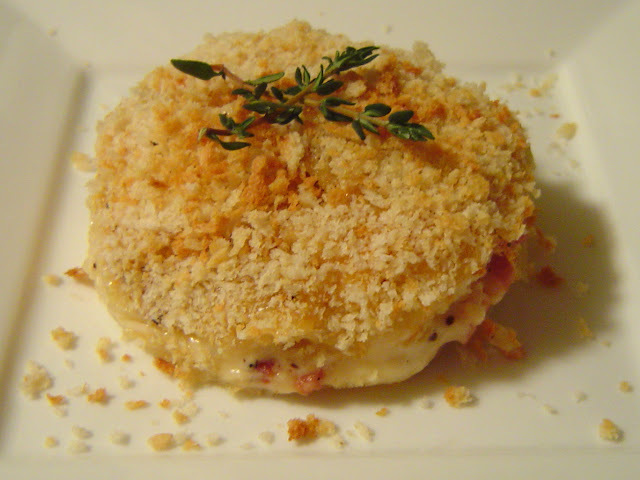 **Place a sheet underneath the dish just in case of spillage** Then remove cover and top with panko bread crumbs. Cook for an additional 5-10 minutes or until panko is lightly browned. 5. Remove from oven and let stand 10 or so minutes before serving. Thoughts: These were spectacular. The potatoes were cooked perfectly and the gouda melted nicely to create a rich and slightly smoky sauce. I find pancetta to get a bit of a sweet taste when browned so it was a nice addition to the gratin. I think it helped keep the smokiness from being too overwhelming. The panko was something new I tried. 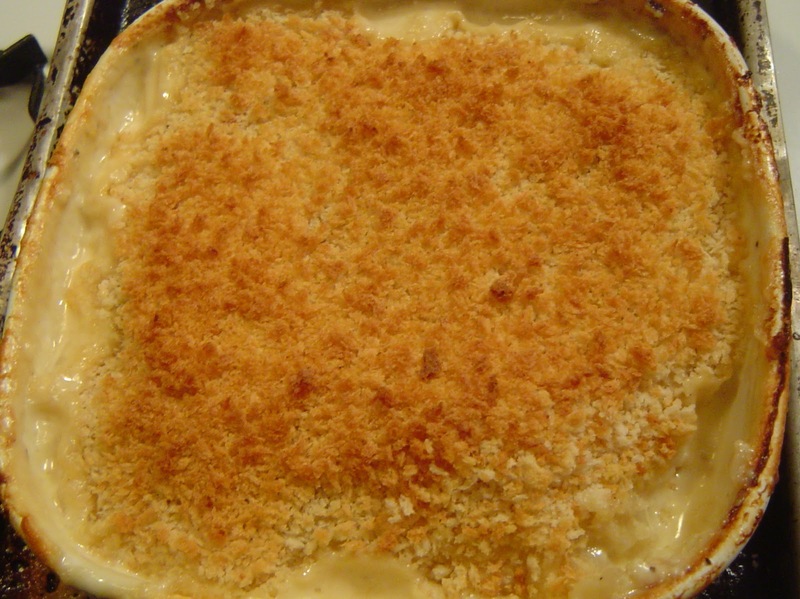 I normally don't add any type of bread crumbs on top of my regular gratin, but at the last minute I thought it would be something different... make it a lil more special if you will. I really like the texture and extra crunchiness it added. The smell wafting out of the oven when these were baking was almost torture they smelled so good. Brent liked them as well and we ended up “fighting” over who got to take the leftover for lunch the next day. I'm definitely going to make these again. I can't wait to try this. I just bought a huge chunk of smoked Gouda and have been looking for new recipes to try with it. Great job! This looks simply satisfying and mouthwatering! That looks so delicious. What a great flavor combo! I love the photo with the sprigs of thyme too. Yummy! I love this and truly all thing potato, unfortunately for me no one else in my family does...so sad. But I could def enjoy this alone! That looks FANTASTIC!!!!! I can only imagine how good the gouda was on that! Yum! That sounds like a very good and decadent dinner treat. Presentation great. Hope you don't mind if I serve this one up and share the recipe! @Fine Diner - I don't have a problem with that as long as you provide a link and credit back to this site as the source. I'm glad you like it! Found your blog when Googling to find something to do with a chunk of smoked Gouda. It's in the oven now, but I did want to comment and say that this is the best blog name ever. I mean ever.